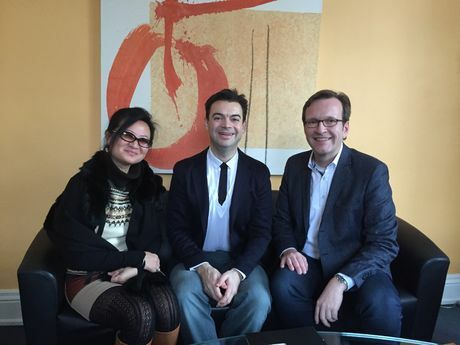 On 14 December 2015 the Croatian pianist and composer Dejan Lazic (in the center of the photo) signed a composer’s contract at Hans Sikorski Music Publishers in Hamburg. During the days prior to this, he had performed as soloist with the NDR Symphony Orchestra in the Concerto for Piano, Trumpet and String Orchestra, Op. 35 by Dmitri Shostakovich, one of the best-known composers in the Sikorski catalogues. Lazic, who was born in 1977 in Zagreb, hails from a family of musicians. He grew up in Salzburg and studied there at the Mozarteum. He has meanwhile performed as a pianist all over the world, from Lincoln Center in New York and Suntory Hall in Tokyo to the Teatro Colón in Buenes Aires. He has toured North and South America, Australia and Asia and made his debut at the BBC Proms in 2011. Lazic has already released many CDs and is also an enthusiastic chamber musician. Alongside his piano, chamber and orchestral music, he has also written cadenzas to selected Viennese classical piano concertos. The Piano Concerto in Istrian Style, Op. 18, premiered in the summer of 2014 and repeatedly interpreted by Lazic himself, has achieved great popularity. Lazic also adapted the famous Violin Concerto in D major by Johannes Brahms, issuing it as, so to speak, the Piano Concerto No. 3 by Johannes Brahms. The collaboration with Hans Sikorski Music Publishers will now begin with that very same Piano Concerto based on the Violin Concerto of Johannes Brahms, the Piano Concerto No. 1 in Istrian Style, a collection of solo cadenzas to piano concertos and selected chamber music. At present, Dejan Lazic is working on a symphonic poem entitled “Mozart and Salieri” to be premiered during the 2016/2017 season.